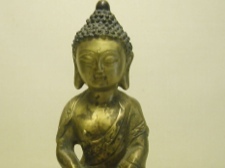 This lovely old bronze buddha has a serene countenance. Its bronze appears almost brushed with gold. The peaceful expression is a work of art in itself. The entire form is graceful and elegant. 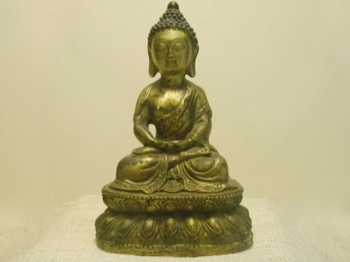 This bronze statue is considered an antique from China. 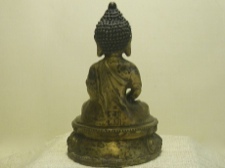 It stands 6 inches tall and its lotus pedestal is 4 inches across. The Buddha is seated in the Meditation posture which promotes the attainment of inner wisdom, emotional balance, and clarity.